Middle-Class Tax Cuts: For Whom? For most Americans, the term “middle class” is more than a point on a statistical income scale. It represents a value system that binds people across income levels. So who or what is the middle class? Is it those with middle income, or those we think of having a middle-class value system? How our lawmakers define this term is crucial since changes in tax law cannot target a value system and must differentiate groups by income level. When we think of a stereotypical “middle-class” taxpayer, our image is that of an intact family with children – the “Ozzie and Harriet” picture of the 1950s, if you will. If that is what most people think of as middle class, then the new middle class is actually at the upper end of the income scale and appears statistically “rich” on paper. Therefore it will be difficult for lawmakers to “lessen the burden” on those who are commonly thought of as the middle class, and at the same time increase taxes on those in the upper income brackets. In today’s terms, they are one in the same. The following chart illustrates the differences between the statistical middle and those in the statistical upper income levels. Nearly three-fifths of the statistical middle is made up of single people, while the overwhelming majority of the upper income earners are married Ozzies and Harriets. 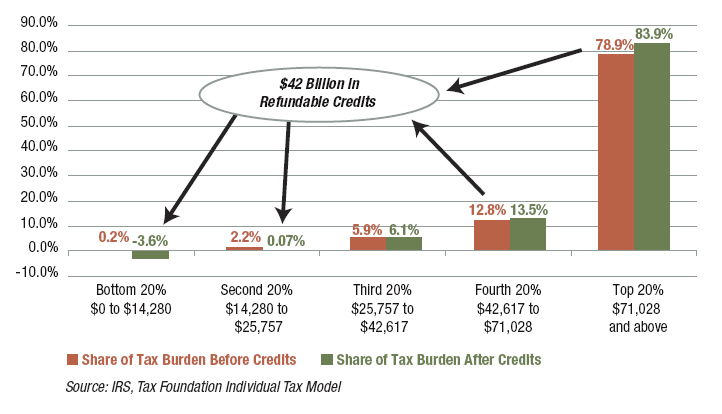 The next chart shows how the tax burden is spread among these groups. The statistical middle pay roughly 6% of federal income taxes, while the highest income groups – which reflect the common notion of the middle-class – pay around four-fifths of all federal income taxes. Efforts to increase taxes on the wealthy will ultimately increase the tax burden for the very people some lawmakers claim to be targeting with their middle class tax cuts. So we have to ask the question: who do our elected officials consider to be middle-class? 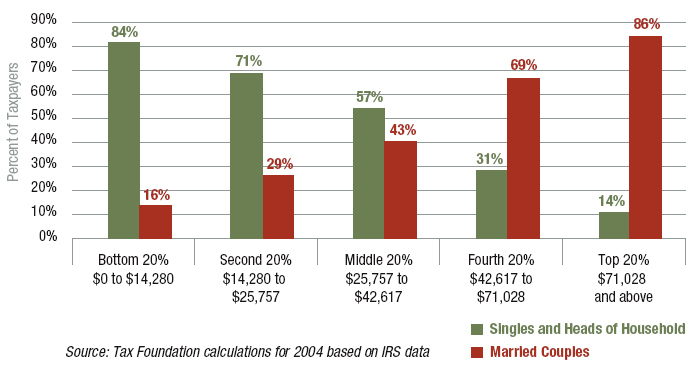 Is it the picture of “Ozzie and Harriet” that now makes up the highest income groups and pays almost all federal income taxes, or is it the large group of singles who make up the statistical middle and pays hardly any?